Stripes can be a major hit or miss! My thought process when it comes to wearing horizontal stripes - am I gonna look as wide as a cow or will I make a statement? A statement in a good way that is! I don't know about you, but that's what I've always asked myself when putting on stripes. However, when I saw this rainbow mini, I knew I could dress it up and make it a fun statement option. 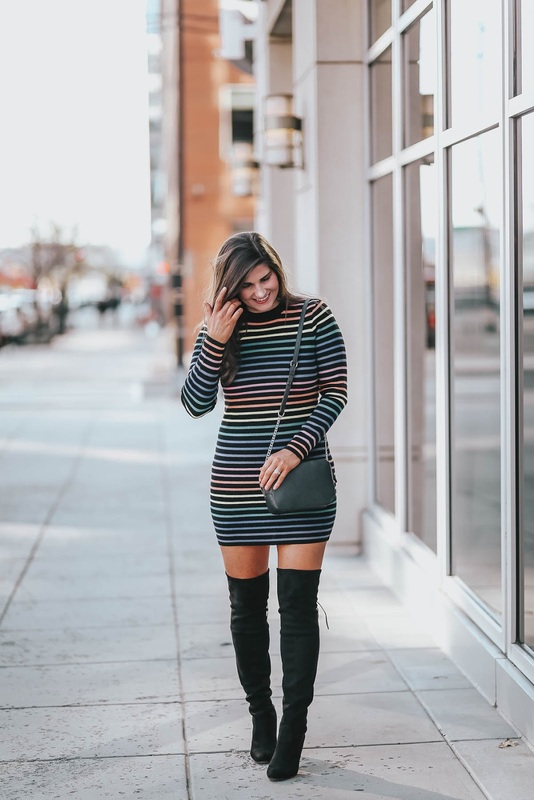 I adore the colorful striped pattern, and while the length is on the shorter end - pairing it with my black over-the-knee boots gives a bit more coverage while leaving just a little bit of leg to show off!